Programmable logic controller is able to set up 64 sets of temperature and control time. Optional Event function, using PLC or switches to switch between 2 different set temperatures. Optional Valve function, adjusting the open/close of the valve by the output value. 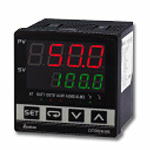 PURCHASE YOUR DELTA DTB ADVANCED TEMPERATURE CONTROLLERS TODAY!